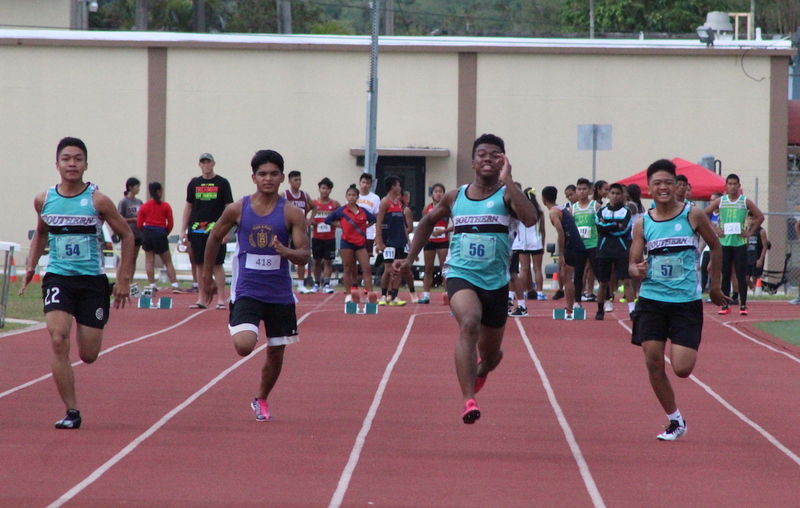 The IIAAG Track and Field’s first Meet of the season was cut short due to heavy rain and lightning midway through the event. Several events were completed before the officials saw lightning nearby and decided to cancel the remainder of the meet. The weather looked promising at the Guam High Track when the event started at 430pm but lightning showed up at around 7pm. Despite the early ending, most athletes got their first crack at taking the field. Athletes looking forward to running the 200m, 300m hurdles, 800m, 4×400 relay, the triple jump and the shot put will have to wait till next week to try their events. “As a team, we tried to get a feel of the competition and the events today. We have alot of new players and this was their first experience,” said Southern High sprinter Gilbert Hollingsworth. Hollingsworth is a key returnee from last season and he looks to help the Dolphins improve their finish from last year. “I’m going to do my best to help my teammates and give them good advice,” said Hollingsworth. Hollingsworth said there are more athletes this season compared to last year and the Dolphins look to finish higher in the team rankings compared to last season. The Guam High Panthers look to repeat what day did earlier this season in the IIAAG Cross Country league and win a double title for both boys and girls. Joe Taitano leads another talented group from Guam High led by long distance runners Emma Sheedy and Isaac Ventura. Both runners picked up victories in the 1500 meter races to give valuable points to the Panthers. Guam High Panther Lexi Brown cleared a full five-foot bar, setting a PR by four inches! Ventura finished the 1500 meter race with a time of 4:34 finishing just ahead of Okkodo’s Zachary Criss who clocked in at 4:38. Sheedy won her 1500m race by a margin of 20 seconds, clocking in at 5:30. Sheedy finished ahead of teammate Janelle Angara who clocked in at 5:50. Angara was the fastest female in the 3000 meters with a time of 12:31. Lexi Brown did her part for the Panthers and got first place honors in the high jump and the 4×100 relay. “We are all one big family from Guam High. We all cheer and support each other,” said Brown. Brown set her personal best in the high jump by four inches. “I personally wanted to come out with a bang in the high jump. I came in third last year and I wanted to do my best in this event,” said Brown. Brown was all alone in the event, clearing 5’0″ to win the event. While some athletes were on the field getting their first feel of competition, one athlete was looking to qualify for the Micronesian Games this summer. Darin Pascua needed a fast qualifying time in his event (400m) to make the team. “My goal is to make the national team to represent Guam this summer,” said Pascua. “I feel that I did enough to make the time but I still have a lot of work to do”. Pascua ran the 400 meters with a time of 53.96 seconds which was enough to make the team. Pascua looks to join the Guam contingent at the Micronesian Games in Yap this summer. “Our coach’s message to the team before the meet was to get a good feel of the first meet, especially for the new athletes,” said Pascua. Unfortunately just after Pasqua’s race, the lightning was seen nearby and the officials did not hesitate to end the competition. Safety was the main priority according to one of the race officials and the meet two will continue next week.